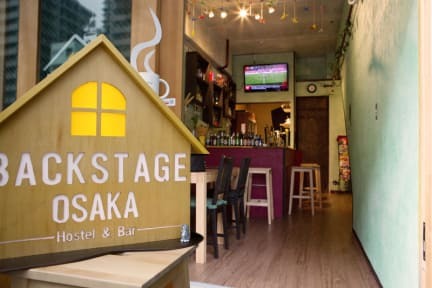 Backstage Osaka Hostel and Bar is a cozy Guesthouse with a popular Cafe Bar located on the main street West-East in the heart of Osaka, 100 meters from the subway station and only a few minutes walk to Nipponbashi, Namba and Dotonbori the busiest and most fun areas of the town! Elected best party Hostel of Osaka by the brokebackpacker.com and best Hostel of Japan Kansai area by thawards.com! Osaka Castle can also be reached quickly, in about 10 minutes train ride. We provide comfy beds equipped with memory foam mattresses and individual curtain for each bed, individual reading lights and high quality sheets and all our rooms have the safety/security equipment respecting strictly the latest regulations of Japan. Lockers are also available for each room. Free Internet Wifi is provided in all our rooms, including in our Cafe Bar. 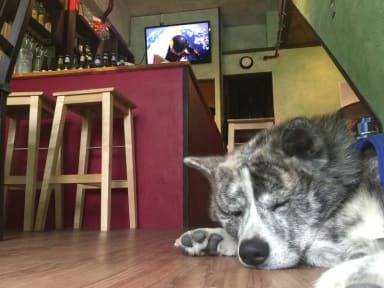 We also have a Cafe Bar located on ground floor for everyone to meet and share great time together with both locals and Guests, we have a lot of drinking options.